I'm incredibly fortunate to be featured over at the Nester's blog today! For those of you popping over here for the first time....Welcome!....Look Around!....I hope this will be the first of many visits for you! For those of you who read my blog already....Welcome Back! I just love my readers! And because I love you all so much, I'm offering a great giveaway today!! In honor of my feature on Nesting Place, I'm giving one of my lucky readers any pillow of their choice from my Etsy Shop. You can even pick one of my custom pillows! Whatever you want!!! But that's not all (now I'm sounding like an infomercial), not only will you get a pillow, but I'll throw in a packet of my Nest Notecards as well. After all this is the Shabby NEST. To enter please leave a comment on this post telling me which pillow from my Etsy store you would like if you win. I will leave the drawing open until 12:00 midnight EST on Friday. Random.org will pick a winner, and I will announce the winner on Monday. Good Luck!! Ooh! I love the ballerina pillow. Girly, but not overly so. Your etsy store is very cute. Ballerina pillow for my daughter. Now I'm headed to Nesters to check out your feature there today! I LOVE the crown pillow....so regal! Thanks for the generous giveaway! I love your pillows! If I won it would be either the crown or the number pillows. Hard decision. This is it! I'm gonna win this one; I can feel it!! I SO want/deserve :) one of those pillows! Thank you very much for this lovely give-away! OHHH! How to choose??? I LOVE them all- but, I think I would choose the bolster pillow with the "5" on it!! I would pick the personalized bolster with a big K. It's my first and last name initial, so I'm partial. Thinking of it for our bedroom! Your work is remarkable!! I honestly would love to get one of the customized bolsters with the no. 7 on it for my 7 kids. I would put it in the front hallway on a bench and that make my year!! Your things are so beautiful! First-time visitor here, from The Nesting Place! I would LOVE to win the crown pillow - and order several more for my closest royal friends! We do so love crowns of all kinds! Wendy everything looks great my fav would have to be one of the number pillows our fav number here is #7 but there are 4 of us counting my 4 legged baby so 4 may be it. I know exactly which one...he bee pillow with the little buttons. Love everything you have. Precious. It would be hard to choose between the Dressmaker and the No.5.....hmmmm. I think dressmaker....well, maybe No.5....ahhh!!! I hope I win! Love the crown pillow with the little buttons. So sweet! Makes me think of my King! What a nice way to start out the day. The bee pillow! It's my absolute favorite. These are simply precious! So glad that the Nestor is having you visit today! I heart that bee pillow!! Too cute! Hi, I came across your blog last night and then checked again this morning to find this awesome giveaway!! I love all your pillows and REALLY love your nest notecards! If I win, I would like one the number pillows with a "4" on it. I luv your blog. I would like to win the crown pillow of course. Everybody wants to be queen for a day!!!!!! Love your blog. Love all your ideas. Thanks for giving me something to look forward to when I wake up. My favorite pillow right now is the bee pillow. Have a great Thursday. Oooh, I can't wait to go read your post at Nesting Place! I would Looooove a No. 4 pillow. I hope I win!!! Thanks to The Nester for introducing me to your blog and Etsy shop! Oh, I happy to discover you. I love your pillows. If I won, which I doubt, I would choose either a monogram or number pillow. OK, I'll admit I'm new here but I'm in LOVE with your pillows, and would love to win any of them but especially the 'Dancer Pillow'! On a completely 'give away' unrelated note...can I have one of each of the pendants? :) Just kidding, while I would love them hubby would kill me! Fun giveaway! I would love the Dance Pillow - perfect for Adorable's room! count me in girlfriend, you know i love your blog!! I love your pillows! I'd be torn between choosing the bumblebee or the 5 (for our number of kids). Hope I win - thanks for the fun giveaway! Love your blog and your store. The dancer pillow is cute, and lovin' the numbers but don't know which number to pick...so I will go with (if I am fortunate enough to win!) a monogrammed bolster pillow. That would just be so gorgeous on my bed!!!! Super cool giveaway! I love your work, the tile pendants are so cool, but if I win I NEED the 5 pillow! That is perfect for our house. You are very generous little lady! Now, I must go check you out at Nester's place. What a great giveaway! I like the little crown pillow with the buttons the best - too cute! Love your Blog! I love your blog and all your cute stuff in your Etsy store. If I were to win, I would chose the crown pillow with the three buttons underneath. It's adorable! I love your Etsy shop! I'd love to win one of the number pillows. The number 5 pillow is melting my heart a bit. Lovely shop. Been a looker for a long time here...and have to say lovin the bee pillow but love the others also. I hope I win...would look good in my house. the crown pillow with the vintage buttons! If I were to win, I would like the pillow with the crown on it. They are all lovely, but the crown one is speaking to me. Off to check out your guest post at the nester. Love your store! I think I would choose the dressmaker pillow! Thanks! Hopped over from Nesting Place - I have come across your blog before and just love your etsy shop! I would love to win the crown pillow - so pretty and perfect for my guest bedroom! Thanks! I would love to have the personalized pillow with a "J" for my son's room. I may have to order one of your pendents...beautiful! I came over from the Nesting Place and love all your stuff. I think I like the bee pillow the best. Or the dancer. No, the bee. Dancer. I think I better stick with the bee. I'd love the crown pillow, perfect for my bed! oh, all of your pillows are SO cute! It is hard to decide, I think that I would like the personalized bolster pillow with an "H" ...or maybe one of the number pillows...no, the personalized...whew this is hard! ;) Ok. I really love them all, but I think that I will go with one of the number pillows. Hi, Wendy, of course count me in on the giveaway. I think I love the bee pillow! oooh! I love a giveaway! I'd definitely would chose a personalized pillow with a "P" on it for our last name. I have a suggestion for your next pillow - how about one with a birds nest? New to your blog, but I love your style! I would love to win the personalized bolster pillow with a D on it! Congratulations on being the featured blogger at Nester's....you have made the big time now!!!!! Please enter me in your fabulous giveaway and I love two of your pillows, the crown pillow or the bee pillow. I think I would choose the bee pillow.♥ Keeping my fingers crossed that the random generator wants to pick me!!!!! Congratulations - you work so hard. Thanks for the great giveaway. My favorite pillow is the personalized bolster pillow. Love it! Choose? You're going to make us CHOOSE? Just one?? Oh my. I want one of each, but the numbers are my favorite. Maybe #4, since I have 4 kiddos too? How pretty! I am so glad that the Nester featured you and I was able to find your store!! If I win (and I am really hoping I do!) I think I would pick the dancer pillow for my daughter. Though, I do love the dressmaker pillow as well. It would be a hard choice I think. Entering and wanting one of these great pillows is the easy part. Picking one is hard! They are all beautiful. I think I'd choose the square bee pillow. They're all great. I love all of your items. If I were lucky enough to win (which has NEVER happened) then I would probably get a personalized pillow with a G on it. I really love the dressmaker form pillow, but I don't think the husband would care for it so much. I have been an avid reader of your blog for quite some time and I just ADORE your work and style. Matches mine very well! I would choose the bee pillow or the No. 4. Who doesn't want to be reminded that they are the "queen bee"? Also, there are 4 of us in the family, that is why I chose the other one. I would love to win the bee bolster pillow. Thanks for hosting this giveaway and congrats on your nester feature! I just love your pillows. How exciting that you are giving one away. My favorite is the No. pillow. Fun! So nice! My fave would be the bee pillow. How cute it would be to put the queen and bee pillows side by side - Queen Bee! Thanks for the giveaway! Your work is beautiful!! I love the Dancer pillow! :) Thanks for the giveaway! I would love the one with the crown and buttons! What simple yet elegant things you have created! I would choose the custom pillow with a monogram of A for our family's last name :) And it would sit right in the middle of my toile couch, which could use a bit of pillow love these days! I love your blog! I'll be back! OH MY! I LOVE the crown pillow!!! Acutally, I LOVE all of your stuff, but being a Zeta Tau Alpha in college I have a strong affinity for crowns as that is one of our symbols. :) So glad you were featured on Nester so I could hop on over! Added your button to my blog! Love it! I just found your blog from The Nester and I love it! I checked out your Etsy shop & you have such cute stuff in there! I'd love to win one of the Number Bolster pillows, No.2, to be exact. It's just me and my hubby right now, so that pillow would be fitting! Thanks for hosting this giveaway. I'll definitely be back to visit! I love how simple and clean your designs are. I especially love the personalized bolster pillow with a monogram on it. Thanks for doing the giveaway! Love your blog! I'd pick the dancer pillow. My daughter would love it! I LOVE your pillows! So fabulous. I think if I won I'd have to pick the bee pillow b/c I really love the book/movie Secret Life of Bees. This is really strange...I had already hearted you on etsy before reading about your on the Nesting Place blog -- anyway, I love your work and that bee pillow is amazing. Thanks for such generosity in your giveaway! Oh I love the crown pillow! I have been a faithful reader of your blog for a while now (but I'm not the best at leaving comments!). I love all of your creations, but I think the pillow I would choose is the bee pillow that is backed with black ticking and has the four buttons. SO CUTE! Thanks- I will be stopping back again. Thanks for offering this wonderful giveaway. Your pillows are awesome. If I were to be the lucky winner I would choose the Personalized Bolster Pillow with a "C" on it. Would be great on my bed. Thanks again! I NEED that personalized bolster pillow. So stinkin cute. I am decorating my new old house and it would be such a great addition. I love your blog! Hiya Wendy! Love your blog as always. I admit I'm a daily visitor to see what you have up your sleeve. I would love to add one of your Crown pillows to our master bedroom. Thank you for the awesome giveaway! I love the crown pillow. Thanks for the awesome giveaway. I love the crown pillow...perfect for me (I claim to be the queen of this house since I come from a family of 4-me being the only girl & now I am the only girl living with 2 sons & a husband!) It is hard to be a girlie-girl in a world full of sports loving boys! Thanks for the awesome giveaway! I love love love the crown pillow!! I would love the No. 3 pillow. We are due with our third child in Sept. That would be a fun addition to the nursery. Ooo I love the crown pillow, but I think I'd have to get a pillow with the no. 6, since there are six people in our family--soo cute! Thanks for the giveaway! I adore the bee pillow! And I'm loving your blog, added you to my reader. I like the bee pillow w/ ticking stripe back. Thanks for the giveaway! Love your blog and love your pillows. Here's to trying be lucky and get picked. I love the crown pillow and the No. pillows. My daughter's room has pink walls with black and white toile fabric and accents. I think a No. 3 would look adorable on her bed. She's the 3rd child and only girl. The dressmaker pillow is my favorite. I think I'm going to have to buy the bee scrabble tile necklace if I can figure out how to use paypal. I love your Number pillows and I have to get me one of those tile necklaces. You've got some great stuff! Great stuff! I love the Bee Bolster Pillow. Can't decide if I'd keep it or give it to my Mom, who loves bees. I love the Bee Bolster Pillow so pick me please! BTW, I have been a long time reader but I guess you'd call me a lurker since I don't comment much. But I love the blog! I love the numbered pillows, and I've so enjoyed the design tips from your blog! If I won, I'd love the crown pillow, the bigger one, without the buttons...I think every "queen" needs a crown...right!? Hi! I L.O.V.E. your blog and handmade items!! My pillow of choice would be the crown pillow! It is adorable and would look perfect in my bedroom!! I love your re-do in your mudroom and laundry/bath. Your kitchen is divine as well!! Thanks for sharing all your great ideas and tidbits!! I enjoy them! So happy to have found this blog and your shop. What cute pillows! If I won, I'd love a personalized bolster with a W on it. Those bees are pretty cute too! I absolutely love your blog and precious ideas. The pillows are all adorable, although I think the bee pillow with 4 buttons is my favorite! I like bee, the crown or the dancer pillow! I love your stuff, but don't often comment! sorry for that! I love your shop and love the dancer on the tile pendant! so cute!! I like the Crown Pillow. I just happened to stop by from another blog and saw you were doing a giveaway. Lucky ME!! I thought the dancer pillow was cute. I enjoyed looking through your blog. Looks like you have some fun ideas. Oh Wow!! My first visit ever, thanks to the Nesting Place! Love, love the number pillows!! Definitely my pick!! Have a wonderful day!!! ohh....I would pick the personalized bolster with a "B" on it! I love your designs!!! I'd truely LOVE the simple crown pillow! OH, I hopr I win!!!! I LOVE your blog! And your style, and your ETSY store, and your beautiful styling! I'm so glad I found you ... and not just because you're giving away free stuff! Your photographs are beautiful. (BTW, I like the personalized bolster (B). I love the idea of you doing the "monograms" and numbers - so simple and pretty). I really love your work! I love the numbered pillows. All of your work is beautiful. Hope to get picked! Thank you for this chance- oh please for me the crown pillow with buttons. this is such a nice treat.....hope I win!!!! I like the Bolster Bee pillow the best although I think each of your handcrafted products are simply beautiful! I love your blog! If I was to win, I would LOVE the dancer pillow to put in my little girls big girl room! I like the Bolster Personalized Pillow and would probably get a letter (for our last name), but my girls both loved the dancer pillow. You are so very talented. Thanks for the chance to win. What a great giveaway! I would have to choose a personalized pillow with a "K" on it for my new, married last name! Thanks! Oh, i love your pillows and your website! i would love one of the bolster pillows with the letter M on it. Our last name :) i really hope i win! I am all about the Dancer pillow!!! I'm gonna win, I'm gonan win!!! I LOVE the crown pillow, so cute! Love, love, love your blog! I would totally go for one of the No. 4 bolster pillows. Are there ever pillows with a nest (like you have on your notecards) - I've checked a couple times but haven't seen it yet? So cute - pick me! Congrats on being featured! You deserve all the recognition you can get for your wonderful talents! I'm so happy for your success with your etsy shop. Your items are beautiful! It's so hard to pick just one fabulous pillow, but if I had to, I'd pick the bee----I've got Spring fever. Oh my....I love your blog. Love, love, love your Etsy shop too. I would love anything from your collection, BUT if I had to choose, I would have to pick the pillow with the bee on it. I just love that! Beautiful items in your store!! I would LOVE to win your crown pillow, its fabulous!! Congratulations on your feature!! Love your blog. I'd have a very hard time choosing my favorite, but since my latest obsession is with crowns, I'd have to choose that one!! They're all beautiful. They are so beautiful! I honestly don't know what I would choose... all of them maybe! hahaha. Probably the personalized one with an E. I really do love the bumblebee also! Thanks! I love the crown pillow with the buttons underneath. I am new to your blog the last few weeks. I love your style! Have a great day! Wow, I came over from the Nester, and absolutely love your designs. I absolutely love the Bee Pillow, it's what I would choose if I won. I also love the dancer pillow for my daughters room, maybe I should make a purchase! lol Love your blog! Hey congrats on being feature on nesters blog!! I love all your ideas and designs!!! Thanks! Love your site! I love the personalized bolster pillow; thanks for the give-away! I love the crown pillow! So cute. Hi there! I've been a lurker for a while now. Love your blog. It's SO hard to choose, but I really like the personalized bolster pillow, a "B" on it for me! I'm torn between the ballerinas and the crown with the ruffles around the edges. Love them both! I like the number bolster pillows. So cute. Thanks for doing such an awesome giveaway. I love the two crown pillows but I would also have to check with my husband. I bet he would like the No.7 pillow as it is his favorite number and the number of people in our family! :) I love your shop. Your nest necklace is adorable!!! What a nice giveaway! If I win (I hope, I hope) I would choose the crown pillow. Hello, I love your pillows and if I win I would pick the No.5 pillow. I really enjoy your blog. Your blog is one of my favorites! I'm so excited for this giveaway. If I were to win, I'd LOVE one of the custom number bolsters. I'd put 2.14.03 on it. That's my wedding date. oooo--la-la...I would be honored to win any of your beauties...but if I need to choose, I'm especially drawn to the crown pillow, I mean what woman/mother doesn't deserve a crown somewhere in her life! If I were picking a second favorite (which it looks like I am, for whatever reason) I would go w/the number 5 bolster pillow....it was my daughters number in all her sports, it brought her great luck, so I'm partial to that number). I will be checking back often, love your blog and your treasures. love your stuff! i love the crown pillow the most! being a former beauty queen i am drawn to them! The dancer pillow would be so sweet in my little girl's room! Sweet stuff! How does a girl pick just one hmmm....I like the no.6 bolster pillow. I actually love them all,I am a daily reader of your blog.I like all your ideas.Thanks for the chance of a give-away. I love the crown pillow or maybe I like the bee pillow better. Argh!!! I'm too indecisive to make up my mind. I'd have to use the random number generator as well to decide. You have fabulous stuff! How fun! I would just love and adore a No. 5 pillow for our wonderful family of 5! A perfect compliment to our shabby chic decor! Congrats on being featured on Nester's blog. Good for you. You have an awesome blog and I love checking in each time you have a new post. I'm a follower, not a stalker ;). Your giveaway is great. It's so hard to choose a pillow, they're all so pretty. I especially like the dressmaker pillow, the crown pillow and the bee pillow. And all of your cards are beautiful. Thanks for the fun giveaway! I love the crown pillow.....or the No. 1 pillow....can't decide! Your things are gorgeous! I love the nest scrabble tile pendant, too. Thanks for offering such a great giveaway! Nestingplace pointed me this way. I love your 'Bee Pillow' with the buttons. All of your items are gorgeous! Great Giveaway! I love all the pillows, but the Bee Pillow is my favorite. I saw on Nester's blog a cute little bird nest necklace, but don't see it on your Etsy. Are they all gone, or will there be more? I love a giveaway! I'd like a crown pillow if I win...and if I don't, I'm still adding it to my wish list! I originally found your blog through the Nester, how fun that now you're back there. I have 4 boys and would love the NO.4 pillow! So cute! Congratulations on being featured! I have been following you for a while and love your little pixies. Hmm...decisions, decisions, I love all of the pillows, but I think I would pick the crown pillow and place it on our bed...or maybe the bee pillow with the buttons...hmm, now I'm all confused again! oops i forgot to say i love the NO.1 pillow. now, does that count me for a double entry? I love, love, LOVE the bee bolster!!! Thanks so much for doing this! I love your blog and try to follow it each day! I would pick the bee pillow (since we have 4 hives)... love those bees! Please enter me in your drawing! I love the bolster with the 5 on it...its adorable. i was just bragging about you over at the nester's blog! I love them all...could see anyone sitting on my bed or on the chair in my kitchen. I think I like the bee with buttons best. But I think it would be cute to get a No. 1, No. 2, and No. 3 for each of my girl's beds...because we jokingly call them by the number of their birth order. 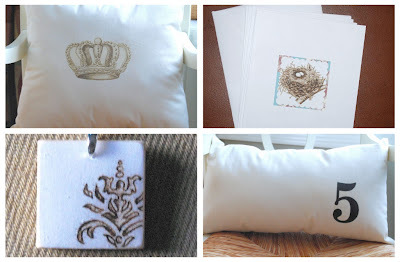 My fav is the crown pillow, just delightful! I love it!!!! As usual, I just love your blog. I love the crown pillow. It would be perfect in my room! I love the bee pillow. I'd give it to my mom for mother's day. She's got a bee thing. Congrats on being mentioned by the Nester. I am a long time follower and would like to say that I would love the dress form pillow but to be fair to the family I think I would want a pillow with a big pretty S on it for our last name. I'm all over that crown with the ruffle! I would love those nest cards too! I'm keeping my fingers crossed that I win this one! I'll post your giveaway on my blog for you too. No. 3 is my fav! You do lovely work! have enjoyed your blog for a long time and so glad to see you over at nester too! i love your pillows and if i could have anything i wanted i would choose one with your nest drawing on it and embellished with buttons. Thank you for the giveaway, so fun. I love the dancer pillow. I've enjoyed your blog for a while now! I love the crown pillow. Thank you for the fantastic giveaway! Pick me pick me! do you think there would be a riot? I want black pillows with white numbers and burlap pillows with nests and birds and toile pillows with a chair sillohette silohette silo wet. I would love to win one of your pillows. But I'd want one with 7 on it. 7 has always been my son's number when he plays baseball and when he played soccer. Oh what a decision- I think I'd have to say.....the dressmaker pillow or the No.5 pillow! I'd get the bee pillow to put in my sunroom in my cozy reading chair that's surrounded by all my plants. The bee pillow is the one I'm lusting for! I'd love to put it on my bed. the bee pillow, the bee pillow!! oh how i love the bee pillow!! i love the number pillows..you are so talented. Oh, I love the crown pillow. Love your work! I would love a personalized bolster pillow with an 'L'!! Congrats on your feature today! !